Notes | New edition of a guide to the many facets of photojournalism--how to get the best shots when on assignment, covering spot or general news, or doing features or portraits. Discusses narrative picture stories, catching candids, creative use of the strobe, shooting with color films, digital imaging and ethical issues surrounding its use, newsroom politics, picture editing, shooting within the bounds of the law, and the history of photojournalism. Abundantly illustrated. The bibliography is extensive. Comments | [01/19/06] I highly recommend this to be on every Photographers bookshelf. Its an easy read with great info! Comments | [10/02/04] Ken knows his stuff. He taught me quite a bit during my time at SFSU. The best book on the basics of photojournalism, but you need to break the rules once you learn them. Comments | [06/05/04] I actually met Ken Kobre at the Associated Collegiate Press conference, my newspaper advisor introduced me to him. After talking with Ken about photojournalism for the better part of an hour he replied, "You know all this is in my book." Wow did I feel dumb I really should have went to a school with a PJ program! O well It took going to college for me to figure out this is what I wanted to do. O yeah great book, pretty much went word for word with our pool side chat. Comments | [06/02/04] This is a GREAT book, a must read, and a have to have book. I learned so much from this book, you can notice if you see pictures from before i bought this book to when i bought it and read it. This is a great peice of literature, and i highly recommend this to be on every Photographers bookshelf. Comments | [02/15/04] the generic, basic, cover-all-your-bases book every PJ 1 class uses. Nothing too exciting, constantly getting rereleased, but nice to glance at every few years. Comments | [10/16/03] I went to San Francisco State because that's where the man who wrote the book was teaching. Ken's courses are hard-knocks, and his book not only covers everything right up to the bleeding edge, but also serves to inspire any would-be photojournalist who picks it up. Contrary to some beliefs, Ken does not cover much in toning techniques, and certainly does not expect his students to mimic the hand-of-god style (employed by CONTRIBUTING PHOTOGRAPHERS) that is prominent in his earlier editions. Comments | [09/11/03] 4th Ed. - Being the ripe old age of 35, a husband and father, and getting a late start into photojournalism, I did not go to journalism school. I read this book because so many spoke so highly of it. It filled many gaps in my knowledge, and is the most comprehensive of all the photojournalism books I have read. Very readable, worth the price. Comments | [02/08/03] I have had the second edittion of this book since 1997. I have read it so many times I've lost count. It's a great creative source for me. I'm rating a 9 only because nothing is perfect. Comments | [12/27/02] just adding that Missouri uses this book too; for its Staff Photojournalism class. Never read it cover to cover, but its author is a Sports Shooter member! Comments | [12/22/02] Always a step behind. But maybe that's the nature of textbooks. Comments | [11/06/02] both a classic,and an essential text. if you read or buy but one photo book, make *this* it. read it, read it again, and refer to it often. Comments | [10/10/02] Not much else I can add - all the comments are correct. This was my introduction into Photojournalism, and I think I read it cover to cover in two days. Great organization and information. Comments | [10/04/02] This book is on the reading list of the Sait's photojournalism program and is well worth it. In my eddition is even talked about Canadian photographer Nick Didlick and his digital revolution. A must! for anyone wanting to get it to the business. 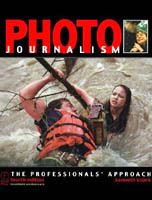 Comments | [10/04/02] This has always been the most popular text book used in photojournalism classes everywhere. Now in it's fourth edition, Kobre's book keeps getting better and better. I used the first edition when I was in school and have added each new edition to my bookshelf, so I now own all four. Wonderfully illustrated, both inside and out front with the Pulitzer Prize winning cover shot by Annie Wells (a former student of Kobre's). If you are a student you must buy this book. Comments | [10/04/02] This is the book that ALL photographers should be made to read....it is a resource that can be turned to when you get bored with whatever mundane job you've been handed ( a 100 yr olds birthday party springs to mind!) and find inspiration that it CAN be made interesting.... READ THIS BOOK.